Cruisin for a brusin with that hat! 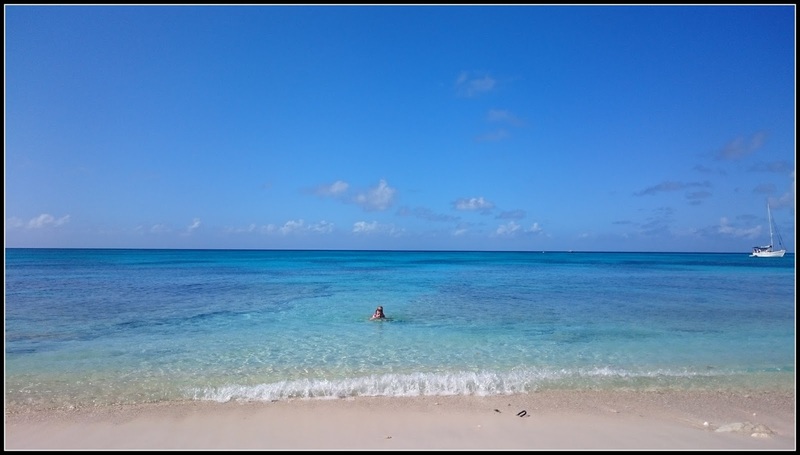 I was growing tired of the land, it was time to hit the high seas and explore the islands that have been home to pirates, a dictator and peace, love & reggae...the Caribbean. Our boat/ship/ark was a colossus! Vegas wrapped up in steel and set afloat. It was a Dutch liner staffed almost entirely by Indonesians. 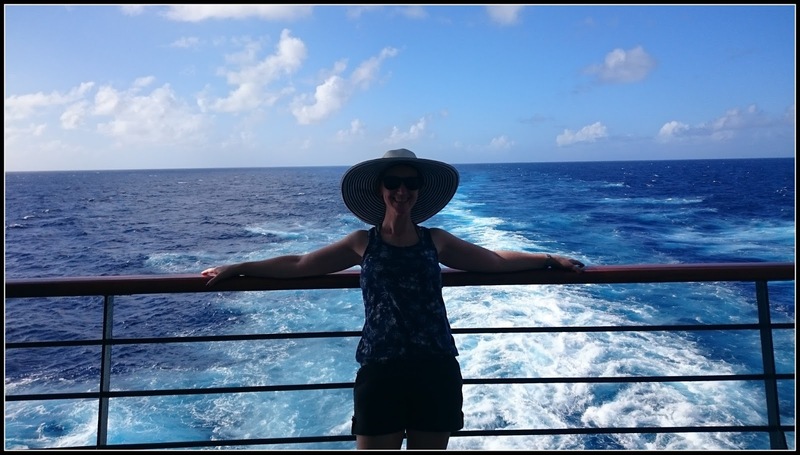 The staff were incredibly friendly, all stopping to say hello as we wandered from port to starboard, bow to stern, endless corridors filled with jolly holidayers drunk from the drink, fat from the food and burnt from the sun. 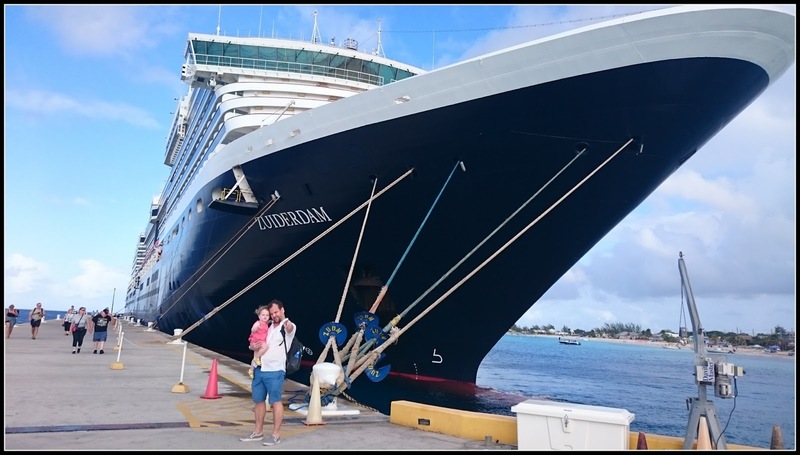 Although you couldn’t swing a cat in our room (I love a good cat swing) it was a relief to leave our bags in one place while we explored the Caribbean. 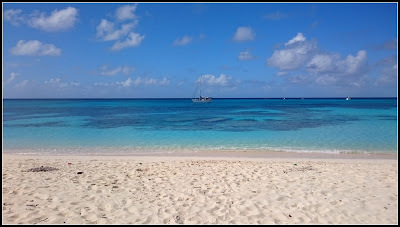 We shored up at Grand Turk of the Turks & Caicos islands in the British West Indies. I was lost for words so I will borrow from the astronaut John Glenn (who crash landed nearby in 1962 after orbiting the earth) and uttered to Mission Control..."it must be paradise". 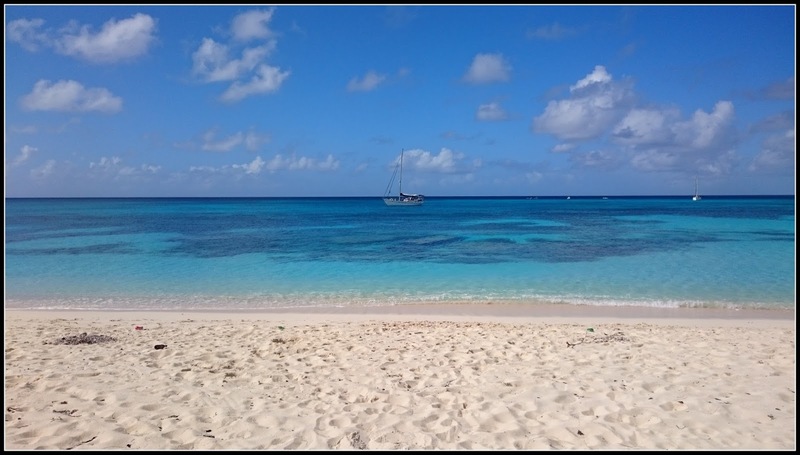 In the 18th century these networks of islands were the perfect location for pirates to stash their treasure. I love finding Irish connections in far flung places, and who doesn’t love swashbuckling pirate stories, so I was thrilled to discover T&C was home to the infamous pirate ‘Calico Jack’ and his Irish mistress Anne Bonny (from county Cork - g’wan the rebel county). If you haven’t heard of Calico Jack, you’re definitely familiar with his ensign - his ship’s flag bore a skull & crossbones, which became known as the Jolly Roger, the emblem of piracy. Anne Bonny was a fiery redhead who dressed in men's clothing and was a famous pirate in her own right. She fought alongside the men and was respected by her shipmates, as they plundered many vessels and amassed abundant treasures. Feeling a piratical burst of excitement and a sense that I was sure to unearth a treasure of my own I threw us into a taxi-share headed to Duke St. The friendly driver chatted loquaciously about these sandy isles we found ourselves in. It became cinematic in my head as he looked and sounded exactly like that wonderfully captivating actor James Earl Jones (aka the voice of Darth Vader). He spoke perfect Queen’s English with booming pride. T&C is a British territory with the Governor appointed by London. In this sun soaked beach paradise we wafted by the Governors rambling rich estate, named “Waterloo”. Just how many cups of tea do you have to have with the Queen to get that gig?! It’s not just the Brits who drove stakes into the ground here. There were three US army bases (given the size of the islands, three seems excessive) they were active for 30 years and played a part in the moon landing. Hence John Glenn’s crash landing a few miles off coast. The islanders honour this event with a replica of Glenn’s space shuttle, now a roadside attraction. As military monuments go, it was pretty damn cool. The US army bases closed in the 1980s. But the connection to America still feels strong, especially as the US dollar is the country’s currency. 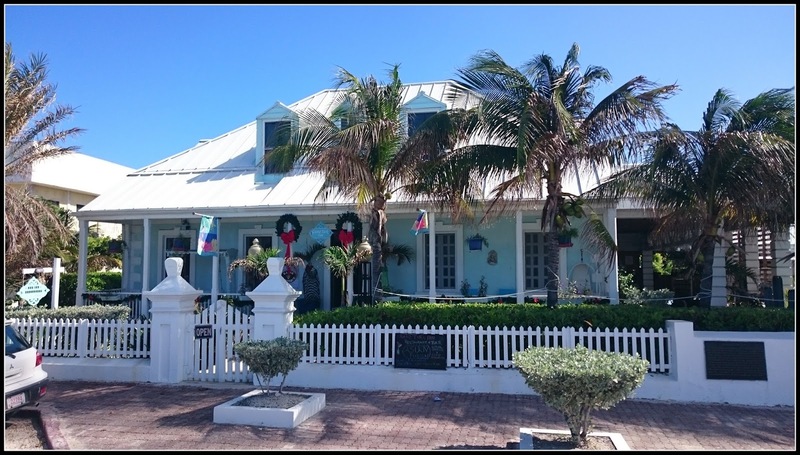 The British and Americans (French and Spanish) aside the first productive settlers to the islands were Bermudian salt merchants. The islands are lined with salt banks called salinas. Salt drew speculators and entrepreneurs, it was the main food preservative used in the western world. They called it “white gold”. Fun fact - the salt stocks from T&C were shipped to America during the Civil War to keep Lincoln’s victorious army’s food supplies safe and edible. Did salt change the face of history? I put this to you as you wantonly sprinkle the white gold over your fish and chips. If you were inhabiting the T&C islands in the 1700s and weren’t partial to the salt business (or general pirateering) the Lighthouse keeper was the job to have. They were the most important people on the island. As we bumped along the dirt road, never updated from horse and cart days, James Earl Jones wrapped up his stories and came to a halt. I was sad my movie had come to an end, I could have listened to his booming tale of island life all day long. 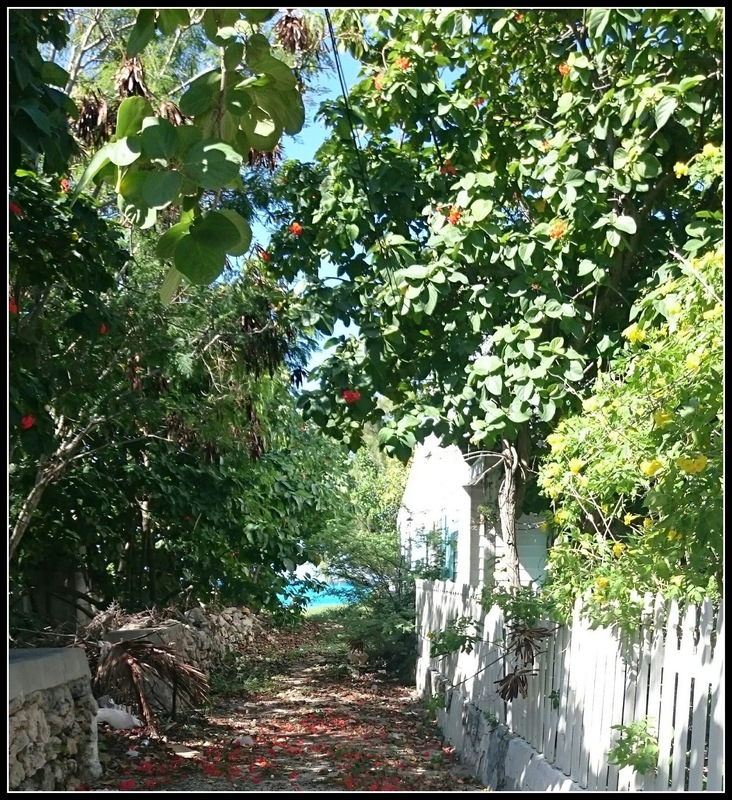 We stepped out onto a quaint old country road (that wouldn't have been out of place in the English countryside on a Summer’s day, a very hot Summer’s day, mind you). The driver advised us that everyone was friendly and crime was low. Then snapped shut the air conditioned car and bumbled into the distance with the rest of the passengers, who decided to return to the ship feeling they had seen it all?! I looked around at our sparse surroundings, there was a couple of houses, some local men sitting under a spreading tree playing chess,a little tuck shop stood alone on the street no bigger than a small shed. Women chatting in makeshift tents selling bits and bobs. Music came from somewhere, the sea bobbed and swelled in the background. People spoke English in an lilt that sounded extremely close to an Irish accent. The driver had told us to look out for whispers of French creole and Dominicans speaking Spanish. All I could hear, if I closed my eyes, was Irish folks in the wilds of the West of Ireland urging me to look at their grandfathers paintings… Paintings you say, I opened my eyes and darted into the urging lady’s tent. The paintings were of life on the island, painted by her grandfather. Instead of canvas her granddad had used the underside of strips of carpet (genius idea). I hemmed and hawed, suddenly the heavens opened up and the gentle lady tucked us in closer. I was hard pushed to chose just one but I plumped for one with bursts of orange, green, blue and black depicted women and men in broad strokes going about their daily lives. Today it hangs pride of place in my home. My only regret is the rain stopped, I stepped out of the tent, and didn’t buy more! With a spectacular double rainbow framing the beach and sea it was time to explore. I had picked up a very vague looking map before we left the ship which looked even more vague as we stood in the country lane. We asked locals for directions as we marched in the beating sun on the dusty path. Turns out the 'country lane' was one of the main streets in town. 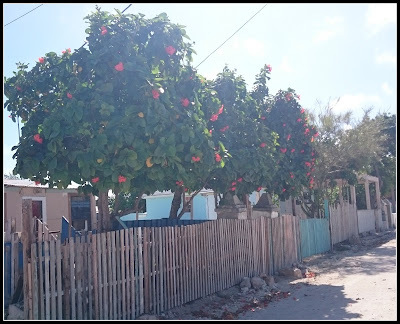 The island is so colourful, from the trees to the birds to the fruit and the the bright outfits the locals wear, even the cheaper houses made from corrugated iron sheets are painted pinks, greens and blues. We stumbled across the T & C National Museum and wandered in. A matronly lady with ruddy red cheeks and a distinct British accent welcomed us, she looked right out of the Cotswolds. I was probably more fascinated by her then the small 2 room museum. I kept expecting her to pull Werther's Original toffees from her pockets and announce she was off to tea. The museum is largely about shipwrecks. T&C is home to the oldest shipwreck in the world, thought to be Christopher Columbus’s ship, the Pinta. 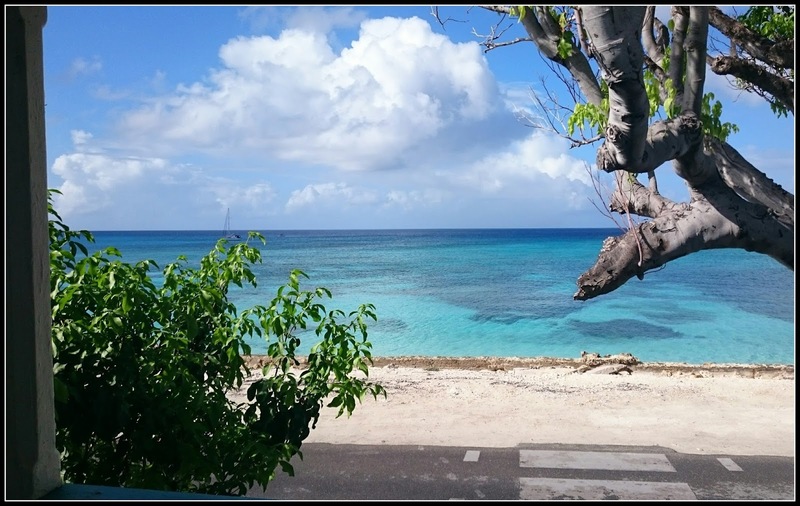 Grand Turks claim to fame is that Columbus landed there in 1492. The proof may lie at the bottom of the ocean! As we stood outside the museum house, necking water and readjusting to the heat. I spotted a plaque stating the timbers used in the museum’s construction were from a dismantled old ship. No one has been able to date the house because they don’t know what ship it is from! Grank Turk is the capital of the chain of Turks and Caicos islands and home to about 5,000 people. 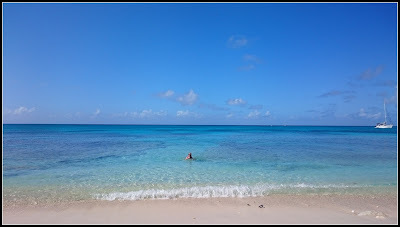 The Caicos, notably Providenciales, is the resort side of T&C. As we traipsed down the road, Roisin strapped to Dom’s back, he filled me in on another Irish connection from the museum - Jeremiah Denis Murphy. An Irishman who came to T&C in the 1870s to dive for treasure and explore shipwrecks, he used the old fashioned (at the time I’m sure it was de rigueur) full helmet deep sea diving gear. He seemed to be a dab hand at the ole diving and became famous in the area. 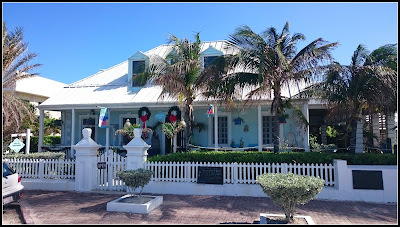 A little further down the street we came across the Odd Fellows Lodge (think the Masons mixed with a Rotary Club) which is one of the oldest buildings on the island. Sadly, it's no longer a Lodge for Odd Fellows, now it is a shop that sells fish and beer, in front of which fellows (perhaps odd) sit outside and smoke. Closer to shore we nosed around Her Majesty's prison, now a museum, not a bad place to have to put in some time. 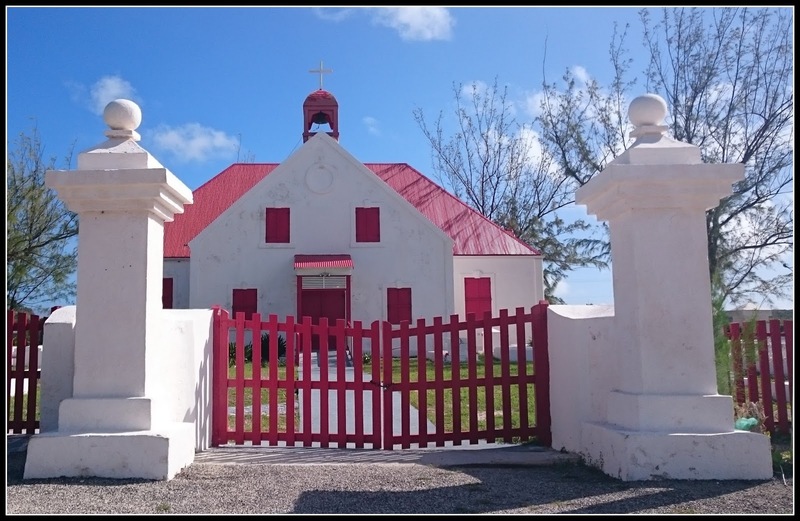 We strolled across the salt plains, where you could see the salt washing up on the banks, to visit St Thomas Anglican Church. We walked up and down and around, using my vague map. I was keeping an eye out for a church-like grey stone building. Finally we arrived. 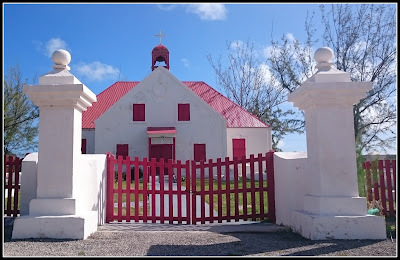 It’s the oldest church on the island, built by Bermudian settlers with timber from Bermuda. It was big and red and closed. Looking at the pretense of a map I declared our next stop would be Cockburn town, home to well preserved 18th century buildings. Sure enough, the ship’s map lead us on a merry dance. We wandered over lakes, past a school, into random neighbourhoods with locals shouting "you lost?". Everyone local we spoke to tried to be helpful but seemed to have little knowledge of street names, even the streets we were standing on! 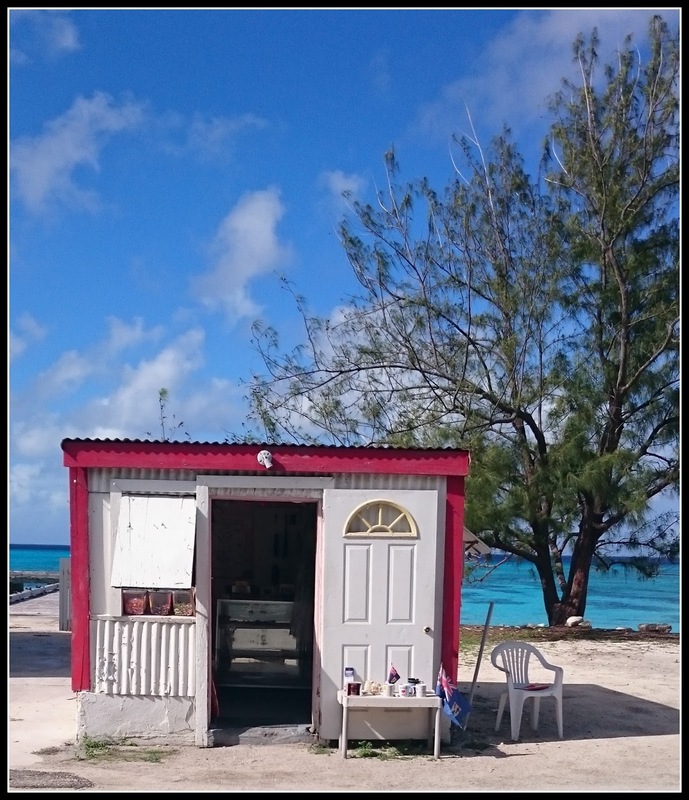 This brought a huge smile to my face, it seemed very in keeping with the laid back Caribbean attitude. As luck would have it, who swung by only our original cab driver, James Earl Jones! He gave us a lift back across the salt banks and pointed us in the direction of Cockburn town (which happened to be the very place he had dropped us off at the start). ‘Town’ is a strong word, even ‘village’ might be stretching it. When we saw a sign for Calico Jack’s restaurant at the Turk’s Head Inn, it was fate, alas it was closed, grr, a continuing theme. If New York is the city that never sleep, Turks and Caicos are the islands that love to nap. Our wanderings did bring us through the picturesque Doctors Lane where I let out a yelp and a skip as the 18th century preserved houses came into view. They were nostalgically British contrasting with the aqua blue sea in the background.